Tomorrow, there is a cookie contest in my new office. I had a hard time deciding what to make – after all, there are dozens of cookie recipes on this blog and hundreds more in the cookbooks that line my shelves. My awesome cousin Barb suggested that I go with a cookie that everyone has had, knowing that my version would knock their socks off. And so, I’ve chosen my chewy gingersnap, a delicious creation of molasses and spices. Okay, so perhaps “chewy gingersnap” is an oxymoron. 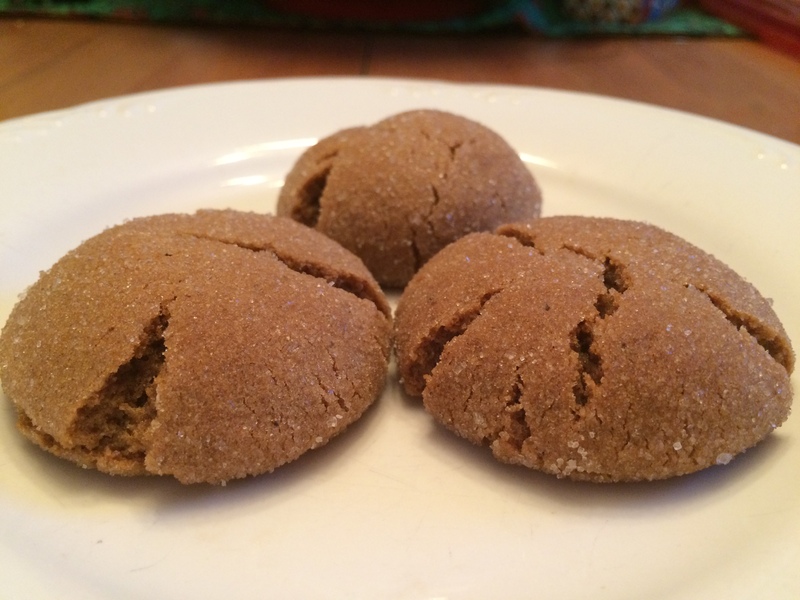 But what else can you call a traditional gingersnap recipe that is tweaked in molasses content and baking time to yield a chewy, soft cookie instead of the traditional crisp? Chewy gingersnap works for me. The trick to these cookies is their baking time, and the limited time they’re allowed to cool on the baking sheets once removed from the oven. Bake them no more than eight minutes, and let them sit on your baking sheets for no more than two minutes, to ensure that they don’t become brittle. Will I be victorious in tomorrow’s competition? Time will tell. At the very least, I’ll get to try lots of treats made my other bakers. *I fill my glass measuring cup to the line just above the 1/4 cup line, which is about 2 1/2 ounces of molasses. Preheat oven to 375 degrees. Line several baking sheets with foil. Place sugar in a small bowl. In a mixing bowl, combine 1 1/4 cups flour with the light brown sugar, shortening, molasses, egg, baking soda, ginger, cinnamon, and cloves. Beat on medium speed until very well combined, scraping the sides of the bowl frequently. Add remaining flour and beat until very well combined. Using a one-inch cookie scoop, scoop dough and roll into balls, then roll each ball in sugar. Place on prepared baking sheets about 2 inches apart. Bake for 8 minutes – cookies will look puffy and slightly under-baked – and cool them on the baking sheets for 2 minutes. Remove to wire racks to cool completely. Remember, the cookies will continue baking as they cool on the baking sheets, which is why it’s very important not to over-bake them in the oven or leave them on the hot baking sheets for too long. Good luck tomorrow! These look awesome!